Location: Bas-en-Basset, in the Haute-Loire departement of France (Auvergne Region). Notes: Château de Rochebaron caps the top of a rocky outcrop located in the town of Bas-en-Basset, about 1.5 kilometers northwest of this town in the far northeast of the French department of Haute-Loire, bordering the Velay and the former county of Drill. The current ruins are the remains of a large set built in the early fifteenth century on the foundations of an older castle, especially the southern facade include a chapel, the gatehouse turret that adjoins and two high turns, known as circular and triangular tower. 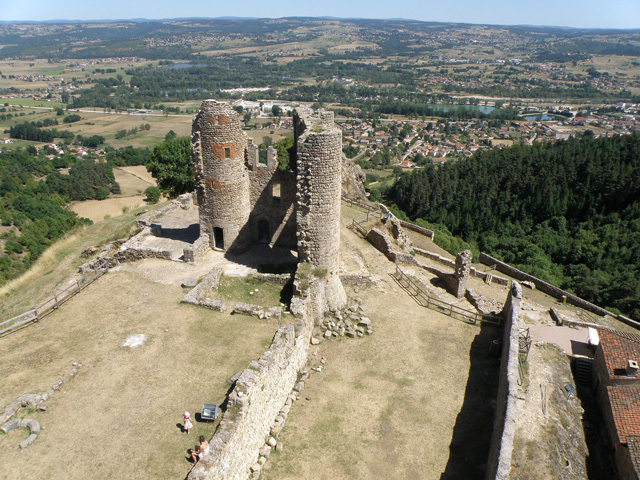 The fortress, under the Drill County and subservient in turn to various noble families, was one of the issues of rivalry between the bishops of Puy and the counts of Drill. Gradually abandoned in the seventeenth century, having not even owner since the early nineteenth century, the castle could only decay quickly. An association of volunteers endeavors since 1972 to safeguard and develop it, and arrange tours. Rochebaron The castle is the subject of a classification as historical monuments since December 1951.Rochebaron Castle, which is mentioned for the first time in 1173 in the cartulary of Chamalières Priory, in feudal times was the seat of a stately stronghold occupying a strategic position on the southern edge of Drill County. The jurisdictional territory (commandment) of Rochebaron included all of the large parish of Bas-en-Basset, who had several villages and hamlets. 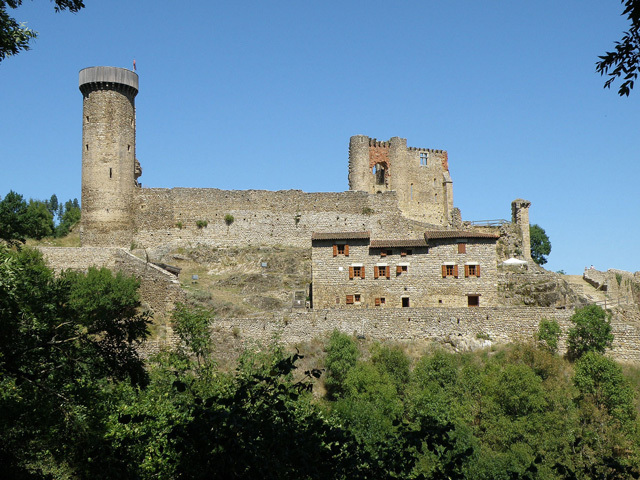 It is possible that the castle was built on the site of an ancient Gallo-romain3 oppidum. Castle Rochebaron belonged in turn to various noble families, the first one being that of Rochebaron, which however does not appear in the texts, through the figure of Pons Rochebaron that from 1169. There is strong admit Rochebaron Castle was founded by the Counts of Forez in the middle of the twelfth century, and the latter the inféodèrent to a family of the same name. During the thirteenth and fourteenth centuries, shared Rochebaron feudal movement was located between two suzeraines powers, who entered in competition several times: Drill County, and the bishop of Puy, which was within the parish of Bas-en- Basset. Moreover, the castle was one of the objects, with other castles Velay, a struggle between the crown of France and the counts of Drill. Evidenced in particular a measure adopted by King Philip Augustus - who, faced with the Count's growing power, intends to ensure control of some castles Velay dependent on the count of Forez - act whereby brocade Rochebaron elected bishop of Puy in 1213, was deposed by the king, who then appointed to this position a cousin of his, Robert Mehun. Moreover, in 1215, Philip Augustus bestowed his cousin suzerainty six castles Velay, which Rochebaron, in principle under the Earl of Drill. However, Robert Mehun failing such obligation made to it, acquire the right the castle, it was in reality never removed from the suzerainty of the Count of Forez, so much so that in 1325, the the then lord of Rochebaron, Érail (or Héracle), made a confession to the count of Forez, except for the village of Bas-en-Basset, who continued to meet the bishop of Puy.